Two University of Wyoming researchers contributed to a new study in which DNA of ancient skeletal remains of people from southeastern Europe were used to determine migration patterns across Europe during prehistoric times. Ivor Jankovic, an associate adjunct professor, and Ivor Karavanic, an adjunct professor, both in UW’s Department of Anthropology, contributed to the new study that is highlighted in a paper, titled “The Genomic History of Southeastern Europe,” published today (Feb. 21) in Nature, an international weekly journal of science. The first migration was the early Neolithic Period — 6,000 Before Common Era (BCE) — when the first farmers, from Anatolia — Asia Minor — spread through Europe. The second migration occurred during the early Bronze Age (3,000-2,500 BCE) when the so-called “steppe population,” from the Eurasian steppe, replaced much of northern Europe’s previous population. The first farmers of northern and western Europe passed through southeastern Europe with limited hunter-gatherer genetic admixture, which occurs when two or more previously isolated populations begin interbreeding. However, some groups that remained mixed extensively — without the male-biased, hunter-gatherer admixture that prevailed later in the North and West, according to the paper. Southeastern Europe continued to be a nexus between East and West, with intermittent genetic contact with the Steppe people up to 2,000 years before the migrations that replaced much of northern Europe’s population. Karavanic, a professor in the University of Zagreb’s Department of Archaeology, was the leader of archaeological excavations of the Paleolithic/Neolithic site of Zemunica cave, from which several human remains were unearthed and used in the study. The discoveries gave needed information on origin and background research. Jankovic, along with Mario Novak, a research associate at the Institute for Anthropological Research in Zagreb, were involved in the bio-archaeological study of human remains from several of the study samples. The involvement of Jankovic and Karavanic in this study started through Novak, who visited UW last year to present a talk. Jankovic and James Ahern, former head of UW’s Department of Anthropology and now a UW associate provost, collaborated with Novak on several previous publications. Before the arrival of farming in southeastern Europe, the region saw interactions between diverged groups of hunter-gatherers. This interaction continued after farming arrived. After the first appearance of agriculture in the mid-seventh millennium B.C., farming spread westward via a Mediterranean route and northwestward via a Danubian route. Farming was established in both Iberia (Portugal and Spain) and central Europe by 5,600 B.C. Ancient DNA studies have shown that the spread of farming across Europe was accompanied by a massive movement of people closely related to the farmers of northwestern Anatolia. But, nearly all of the ancient DNA from Europe’s first farmers is from central and Western Europe, with only three farmers reported from southeastern Europe, the paper says. To understand the dynamics of this migration process, Jankovic, Karovanic, Novak and many other researchers contributed to the analysis of genome-wide ancient DNA data from 225 skeletal remains of individuals who lived in southeastern Europe and surrounding regions between 12,000 and 500 B.C. These areas included the Balkan Peninsula, the Carpathian Basin, the North Pontiac Steppe and surrounding regions. “These results reveal the relationship between migrations, admixture and subsistence in this key region and show that, even within early European farmers, individuals differed in their ancestry, reflecting a dynamic mosaic of hunter-farmer interbreeding,” says Ron Pinhasi, co-director of the study and an anthropologist at the University of Vienna in Austria. 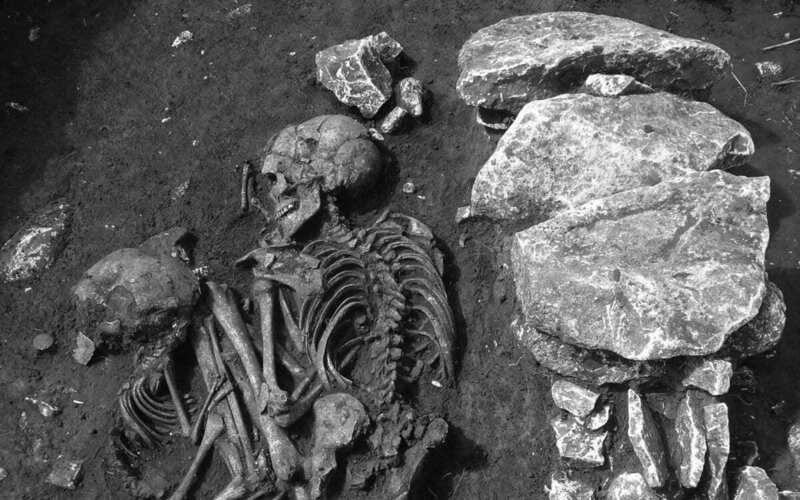 While the study has clarified the genomic history of southeastern Europe from the Mesolithic to the Bronze Age, the processes that connected these populations to those living today remain largely unknown, the paper states. An important direction for future research will be to sample populations from the Bronze Age, Iron Age, and Roman and medieval periods, and compare them to present-day populations to understand how these population transitions occurred, according to the paper.